Here’s the most wonderful news: Research published in the Journal of Nutrition suggests that consuming flavanol-rich cocoa may improve your skin. 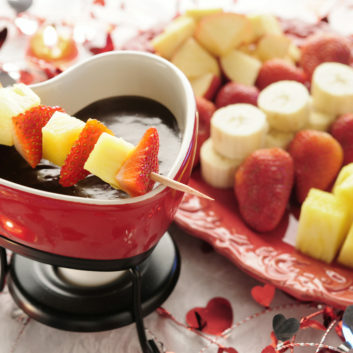 Dip fresh fruit into my guilt-free dark chocolate sauce to get the added benefits. In a medium saucepan, whisk the cornstarch into the evaporated milk. Place over low heat and stir in the cocoa powder, sugar, vanilla, and salt. Cook, whisking constantly, until thoroughly combined and the liquid starts to thicken, about 10 minutes. Serve immediately with strawberries and pineapple (or other fresh fruit, such as sliced apples, pears and bananas).